A couple of months ago we went to London for vacation and to visit family and one day while shopping I noticed a variety of colorful teapots in the display window at Whittard of Chelsea. This store has the best selection of fine loose tea, teapots, tea cups and mugs. 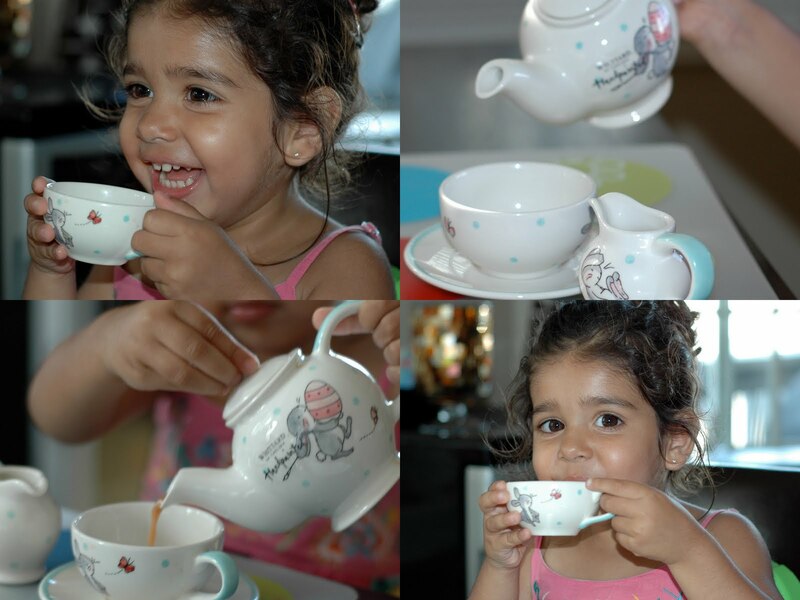 So my aunt and cousin were so sweet and thoughtful and bought a tea pot set for my daughter. She loves it and she has "tea time" almost everyday. I also love the mugs and tea pot they gave me as a gift. They are so bright and stylish and perfect to use when friends stop over for a cup of tea. One of my favorite things to do is to drink chai tea in the afternoon and it is such a family tradition to do this when we all get together. My mom makes the best fresh Masala chai, my sister in law makes the best Ginger chai, and my aunt and cousin in London make the best English tea. My sister...well she just likes it when we all make tea for her! Here is the tea I typically make. I guess I will call it spiced tea or masala chai. Place the water in a pan. Add the cinnamon, cardamom, and cloves and bring to a boil. Next, add the loose black tea and simmer for 5 minutes. If you prefer a stronger and darker tea then simmer a few minutes longer. Add the milk and sugar and bring to a boil. Turn off heat and using a tea strainer pour tea into tea cups. Serve immediately.